The 46-year-old Encinitas mom of two sons deserved the break. A month earlier, she was in the Sahara Desert finishing the Marathon des Sables (marathon of the sands) — “The Toughest Footrace on Earth.” Lee endured a brutal 52-hour run-climb-slog covering 156 miles of trails, dunes and hills in a five-stage race. The longest leg was 52 miles. The heat? Between 104 and 115 degrees. She ran the North Pole Marathon in April 2016. But why pick Marathon des Sables for the African leg? All MDS runners carry their own food and water, but Lee didn’t consume the right amount of salt. The 52-mile stage began at 8:30 a.m. She wouldn’t finish until dawn the next day. Memories of North County coastal runs boosted her mental toughness. She placed 112th out of the 218 women finishing the race (15 dropped out). Overall, 1,183 started the race in Morocco — with close to 100 quitting before the end. Times of San Diego: When did you leave for MDS and what day did you get home? Describe the trips. Vivian Lee: I left for MDS on April 4 and came back on April 18. I flew out from LAX to London Heathrow on a direct flight with Virgin Atlantic, and spent two nights (April 5 and April 6) in London. I purposely chose to arrive on April 5 since I would join the UK runners on one of the three charter flights in the morning of April 7 from Gatwick to Ouarzazate, Morocco, the gateway town to the Sahara Desert. If I planned to arrive April 6 and there was any delay with the trans-Atlantic flight, I would miss the leg from London to Ouarzazate. I always plan the travel itinerary to allow some buffer room for delays or cancellations, especially with international travel for an important event. The MDS atmosphere really started in Gatwick airport the morning of April 7. I could easily spot fellow MDS runners in their running gears. Especially the ultralight rucksack on the people’s back – almost everyone brought it as a carry-on luggage because no one would risk losing the rucksack in the checked in luggage. The three-hour plane ride was like Spring Break party – the air was filled with excitement heading to the desert. When we arrived at Ouarzazate airport, the race director Patrick Bauer and the crew formed a receiving line to welcome us upon arrival. The legendary Bauer, a French concert promoter, first traversed the Sahara Desert for 200 miles on foot and alone in 1984. Under the relentless Sahara sun, he had the grand idea to create a similar experience for others. 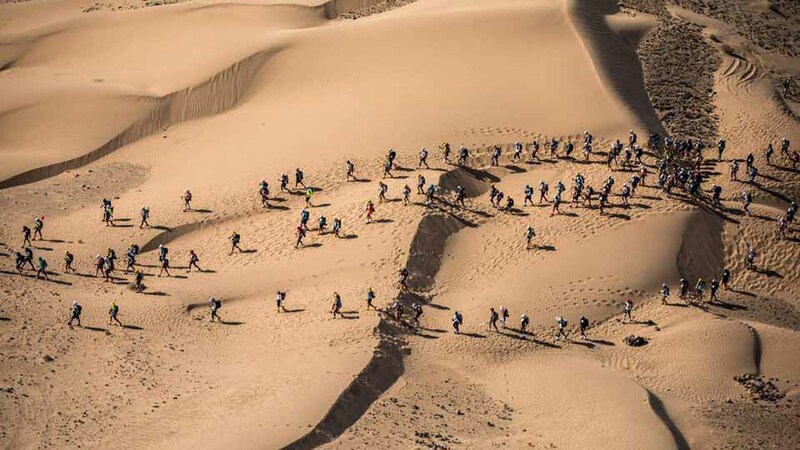 Two years later, Marathon des Sables was born and 186 competitors ran the first MDS. I was awestruck when I stepped out the terminal and received his kisses on my cheeks. Imagine how a grade-school boy would feel like when he gets a chance to meet Superman in person – that was me at the moment! How did you feel at finish? How were finishers greeted? What did you tell your family? Stage 6 was not timed – it was a run for charity. It was compulsory to finish Stage 6 in order to be included in the general ranking, but the time was not calculated as a part of the ranking. The finish was really at the end of Stage 5. Runners received their finisher’s medal at the end of Stage 5 and there was a finish line party that night at camp followed by the award ceremony. Stage 5 was physically challenging but emotionally joyful for me. My feet were in the worst shape – eight blisters that got irritated with every step I took. That was the sixth day of the race and believe it or not, I started to get used to the discomfort. It was not because I was a superhuman or anything – I am pretty sure that a lot of the runners felt the same way. As the race progressed, I saw more and more runners were limping at camp, and the number really peaked after Stage 4, the long stage. An estimated 500 people visited Doc Trotter (the medical team) on Day 5, me being one of them and waited 2 long hours in the queue. Doc Trotter also dispensed gauze pads, medical tapes and antiseptic iodine to runners who were able to tend their blisters themselves. So the number of runners with foot issues was even higher than 500. Despite the discomfort, it was probably the most exciting day throughout the race. I had certainty that there was no way for me to get a DNF (Did Not Finish) due to my physical limit. I had experienced heat, sandy dunes, jebels (mountains in Arabic), and long run in previous stages so that I knew my ability to handle all those. I had a lot of fun that day. I would tag my tentmate saying “You are it!” when passing by, I would high-five the crew along the way, and I would strike a pose in front of the photographers. I imagined how to cross the finish line holding the T-shirt decorated by the orphans from Ninos De Fe [her charity] so that they could see it via the webcam. It was a mixture of relief, excitement and disbelief throughout the 26.2 miles. I had so many thoughts going through my mind that the entire marathon distance did not seem to be long enough to completely absorb all these feelings. I was relieved that the race had finally come to an end – I had never been so exhausted in my life before and desperately needed some rest and recovery. I was excited about crossing the finish line, which I had been envisioning so intensively for several months. Again, Patrick Bauer was at the finish line to award every finisher the medal. When I got the medal on my neck, I hugged Patrick for a long time and said a bunch of things that I do not remember clearly. Probably something along the line of “Thank you!” “It was the hardest thing” or “I am so happy.” It did not matter what I said, for sure I was absolutely elated! Your overall speed was 2.73 mph with your fastest leg being 3.54 mph. How much of the race was walked and how much jogged? Did you ever use walking sticks? I did not bring poles to use for MDS. Pace-wise, unlike road races, MDS could not be tackled with an estimated pace. 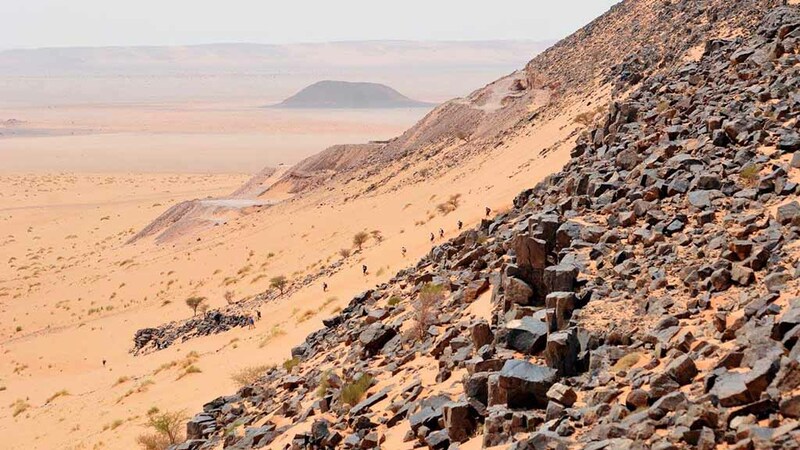 The MDS organizer purposely alters the route every year and keeps the route a secret till all runners arrive at the desert. It was designed to throw some surprises at the runners, which makes this race so unique. Climbing over the jebels would be several times slower than running through a dried river bed, but requires a lot more effort and you have to throw the concept of pace out of your head. The only pace we had to beat was the pace of the camel – since the Berbers swept the course with the camel. Overall I would say that I jogged about 20 percent or less. However the rest were not walking at all, it was either climbing or descending or powering up and down through rolling sand dunes. Plus the time spent in the medical tent at checkpoints. What did you eat during the race? How did you choose these items? Any regrets on what you chose to pack for meals? I had spent hours online reading backpacking blogs about food or at grocery stores calculating weight-to-calorie ratio in order to shed an ounce or two from the pack. The organizer requires a minimum of 2,000 calories per day for the seven-day race at the check-in. Obviously it was not enough calories – we probably burned more than 2,000 calories a day from the race alone, not counting in the metabolism. During the race, I would run into a calorie deficit for sure and what I had to find out was how much “calorie debt” I could carry without getting into trouble. Since February, I started to document everything I ate during the weekends while training with back-to-back long runs. Plus I just did not have that much appetite after a race – so as long as the calories got in the body, I consider that mission accomplished. One thing I regret was that I did not pay close attention to the sodium content of the freezer dried meals. The organizer provided salt tablets, and I had no experience in terms of how much sodium I would need. I took only half of the recommended dose since I am very petite in size, but that combined with the high sodium content in the freezer dried meals caused my body to swell. The swelling brought the misery to my feet. By Day 3 the swelling started, and by Day 4 it was hard to put my feet into the shoes. Tight shoes was a recipe for blisters and I got plenty. So it was not the food itself, but my knowledge with the food and my body. Experienced ultra-runners are keen at knowing their body, while road racers really do not have to worry about it with the relatively “short” distance of a marathon. Did you ever run low on packed water? What did you backpack weigh on average at start of each stage? What were the highest temperatures you experienced? Any comfortable days? I never ran low on water. Every runner was given a “water card” that would be punched at each checkpoint where water bottle(s) were handed out. Normally it is one bottle (1.5 liters) in the morning at camp, one bottle at each checkpoint along the course, and three bottles at the finish line. The temperature according to my GPS watch was between 41 and 47 C (105 – 116 F). Some parts along the course felt a lot hotter – like the dried riverbed, the valley and the worst were the sand dunes since they absorbed all the heat. On top of jebels were always better as there would be a little wind. Day 1 probably was the most comfortable day since it was a shorter and less technical course, and I got back to camp very early in the afternoon — avoiding the worst part of the heat. How did you stay in touch with you family? What kind of chats did you have? I was able to send one email a day limited to 1,000 characters. I sent the email to my husband, telling him how the race went and how I felt mentally and physically. He then posted my message on Facebook to keep my friends informed. How much did the whole trip, including entry fees, cost you? How much did insurance cost? The entire trip costs about $5,000. The registration fee was 3100 Euros, and the flight from LAX to London to OZZ was $1,100. Plus a couple of days in London before and after the race. I did not purchase extra insurance – the registration fee includes the cost of medical evacuation and corpse repatriation! What was Stage 4 day like? Anything unexpected? Was this the farthest you’ve ever run in a single day? Stage 4 was no doubt the longest and the toughest day in my life. Two months before the race, I increased my training mileage significantly and did back-to-back long runs on both Saturdays and Sundays during the weekends. But that kind of distances could only be considered long runs (15 to 20 miles each day) for marathon training, and merely serve as a warmup for the 50+ mile long stage during MDS. In March, I felt that I should have at least one weekend running in the ultra distance range so that I knew how my mind and body would respond to this monster distance. The weekend of March 11-12, I pulled out a 60-mile weekend beach run carrying a 15-pound pack: 40 miles on Saturday and 20 miles on Sunday on a diet simulating the MDS race: energy bars and freezer dried food. Stage 4 during MDS turned out to be a lot harder than the 60-mile weekend training run, but what I learned from that weekend taught me the most important lesson: how to ignore the little voice in the back of my mind telling me to take a break. The long stage could be done in two days and the organizer would provide some bivouacs and lounge chairs at Checkpoint 5 for runners to sleep if they choose to do so. However until you reach the finish line of Stage 4, the time spent on sleeping at the checkpoint would still be added towards your total time. My strategy was to finish the long stage in one push without sleeping break on the course. I know that physically I am not on the stronger or the faster end among MDS runners – many of them are of elite caliber. I was counting on being tough on the mental game to deliver the best performance within my physical limit. That is why I pre-determined to finish the long stage without any sleep. During the race, it eventually took a lot longer than I estimated. However, I never considered getting comfortable and taking a break at a checkpoint. This was the stage that I had my best stage time ranking. It is all mind over body. Two things went quite unexpected during Stage 4: how sleepy I would get around 3-4 in the morning and how much fluid retention I was experiencing. My 40-mile run at home took me about 10 hours, and I added 50 percent buffer to my estimate knowing the heat could slow me down. Since Stage 4 would start at 8:30 a.m. on Day 4, I was expecting to finish this stage close to midnight – which is perfectly fine since I normally go to sleep late. However the terrain was a lot tougher than I imagined and it took even longer than what I thought was a “conservative” estimate. Between Checkpoints 6 and 7, I was so sleepy that at first I thought I was about to faint due to low blood sugar level – or in runners’ term, “hit the wall.” I could not keep a straight line going forward. I ate energy waffle and energy chews – but the lightheadedness continued. At one point, I walked a dozen steps with my eyes closed and startled myself when I almost lost my balance. Then I realized that the lightheadedness was caused by the sleepiness. Once the sky started to brighten up and the sun rose, the dizzy feeling almost immediately went away – that is how amazingly our internal biological clock works. The fluid retention was another big issue and the biggest contributor to the blister misery. As I mentioned earlier, with only four marathons on my resume, I had a crash course during MDS with the inevitable trial and error. While I avoided a worse problem of kidney failure due to dangerously low sodium level in the body, my feet suffered plenty from the blisters caused by the fluid retention due to too much sodium in my system. Any injuries or illnesses battled during MDS? Blisters. I am grateful that the blisters did not come in full force till the late stages of the race. Day 1 was fine, and only two mild blisters on Day 2 and 3. The long stage on Day 4-5 really turned the table – eight blisters in total with several at the most vulnerable spots. Somehow it did not bother me too much mentally since I kept thinking that there was only a marathon left to run. Did you run mostly alone? Who did you get to know? At bivouacs, did you reunite with North Pole Marathon friends? I ran mostly alone, except the night during Stage 4. I met three French runners and we raced 40 kilometers (almost 25 miles) together through the night, from sundown to sunrise. We were calling each other’s names so that we would not fall asleep on the course. We chatted with broken sentences, talked about politics by combining politicians’ names with thumbs up/down. We ran across the finish line hand-in-hand. Later at camp, we visited each other’s tent and I shared with them the astronaut ice creams I carried as a special treat with a Tupperware for five days. Even with the language barrier, we understood what it meant to be “friends for life” – a truly life-changing experience. My tent-mates were amazing. One of them was a North Pole Marathon alumnus, Xibei Li. I have several mutual friends with Samir Patel and was delighted to meet him in person. He was running with his brother-in-law, Manish Patel. There was a father-son team, Matt and Calvin McKinley, from New Mexico. The most experienced runner in our tent was Brian Hamilton. He is a Leadville 100 finisher and was the fastest in our tent – always the first person to finish the race for every single stage. I also reunited with several other North Pole Marathon alumni — Zacharias Daniilakis from Greece, Lise Gronskar from Norway, and Archie T. from India. The meet-ups with my FB friends whom I never met in person before were quite entertaining. The most dramatic one happened between me and Marianne Zaikova from Finland. We ran into each other during the last stage of the race and we were screaming at the top of our lungs when we finally met! If your ultimate goal was running the Marathon Grand Slam, why didn’t you choose an easier African marathon? Great question since I had blamed myself many times during MDS for picking a race that could kill myself. Well, that is a little exaggerating. But when I saw other runners pulled out of the race and when I had to choose between dehydration and kidney failure, the fear that something could go wrong certainly lingered in my mind during the race. I signed up since I would have friends in the race and the schedule fit perfectly – three months after the Asia leg and three months before the South America leg. Also to be honest, I underestimated the difficulty of MDS when I registered. By the time I started to prepare for MDS in January and learned that even some seasoned marathoners could not finish the race during the first attempt, I was concerned. However I do not like to change course once I have decided on doing something – I am totally Type A personality – so I put in extra amount of effort to prepare myself. That is why I spent almost all my free time fine-tuning my food and gear in order to make the pack an ounce or two lighter. It might not make that much difference physically, but all that the effort helped me to focus my mind on the race and boosted my confidence when I got to the start line. Are you still on track to do all the marathons mentioned in your blog? Yes, I am. I finished five races since April 2016, and have two races left before the grand finale in Antarctica in November 2017. Did you get checked by a doctor after your return to San Diego? Any issues you’re dealing with? Not by a doctor. Two toenails are approaching their end of life, and the blisters are healing now. How soon after the MDS did you run again? When and how far? What’s your training regimen now? I came back home on April 18, and went out for a run on Saturday, April 22. I ran eight miles along my favorite route — Highway 101. Since my next marathon is Inca Trail Marathon with high altitude and monstrous elevation gain (from 8,000 to 14,000 feet), I will do less road running and more strength training and trail running with climbs. I have planned some weekends to run in Mount Woodson and Mount Baldy. When you’ve completed the Marathon Slam, what will you do to challenge yourself next? I want to do more staged races such as UTMB (Ultra Trail Mont Blanc). I have yet to make it to the geographic South Pole. I do not plan to be a “pole tagger” – someone who flies there, tag the location for a social media post and flies back. That is a lazy way to arrive at the pole. I will most likely ski the last one degree to the South Pole – I have seen people do that to reach the North Pole when I was there. The options are still open for that. How much did you weigh at start of MDS? How much after? What do you weigh today? What is your height? The two, three weeks leading to MDS, I managed to gain several pounds as a “reserve” since I would be on a calorie debt during the race. I weighed myself three days before Stage 1 and I was 112 pounds. When I got home, I was 113 pounds on April 18, but dropped steadily to 108 pounds on Sunday, April 23. The weight (which is my normal weight) then stabilized. I would guess that the fluid retention was the culprit for the artificial weight gain. My height is 5 feet 3. Will you run Badwater at some time? I am not qualified for Badwater yet. I heard a lot about Badwater during MDS and I even met some amazing runners who were Badwater winners/top finishers like Lisa Smith and Amy Costa. Badwater still scares me at this point, and UTMB (Ultra Trail Mount Blanc) is a more realistic goal that I have been searching a lot lately. Did you raise any money for charity this time? If so how much, and which charity? I am raising money for Ninos De Fe orphanage in Tijuana and have raised more than $3,400 so far. How did you pass the time mentally during the race? Listen to music? Did you try to distract yourself from conditions or embrace the pain? I did not listen to music due to the weight concern. I brought my iPhone, but saved the battery only for taking pictures. Starting in March, I ran without listening to anything so that I would be used to it during MDS. It turned out to be a very pleasant experience that I got to spend time with myself. There were random thoughts popping up in the brain, and if there was one that excited me, I would “grab” it and follow its direction into memory lane or into imagination game or whatever it leads me. By the time I arrived at the desert, I was looking forward to having seven days of “mind-playing” time during the race. Sometimes I would fix my eyes on one runner in front of me and guess how long it would take for me to pass him/her. Sometimes I would try to remember the lyrics of a song – attempt to sing it in my head till I got stuck and try again. And converting between metric and imperial systems must have killed many miles – try mental math to convert from Celsius to Fahrenheit. Once the body got really fatigued, the mind was too slow to have much activity. It is almost like in a trance state – that is why hallucinations are common among ultra runners. The mind went numb, and all I had in my head could be one sentence or one scripture repeating infinitely. The morning of the long stage, I asked my tent mate Brian (the Leadville 100 finisher) about how to mentally handle the depressingly long distance. He taught me to ignore the total distance, and just think about the next checkpoint. One thing I learned years back on how to handle any pain was to ban the word completely. I went to a hypnobirthing class, and learned to rewire the brain to eliminate any perceived danger so that my body does not go into “fight or flight” mode. For example instead of thinking “It hurts with each contraction,” I would think “There is some pressure with each surge.” I was able to give natural birth to both kids without any form of anesthesia. The tools I learned from hypnobirthing served me very well in distance running. I never used the word pain when things went wrong – I would say to myself that I had discomfort with IT band, pressure against the toenails, sore spots under the ball of the feet, and etc. Would you do the MDS again? How soon? During the stages of MDS, the answer was a firm no. Once I got back home and got comfortable, I have been searching staged races a lot, especially UTMB (Ultra Trail Mont Blanc). I need 15 points to be eligible for the UTMB lottery, and even a hard race like MDS only earned me 6 points. 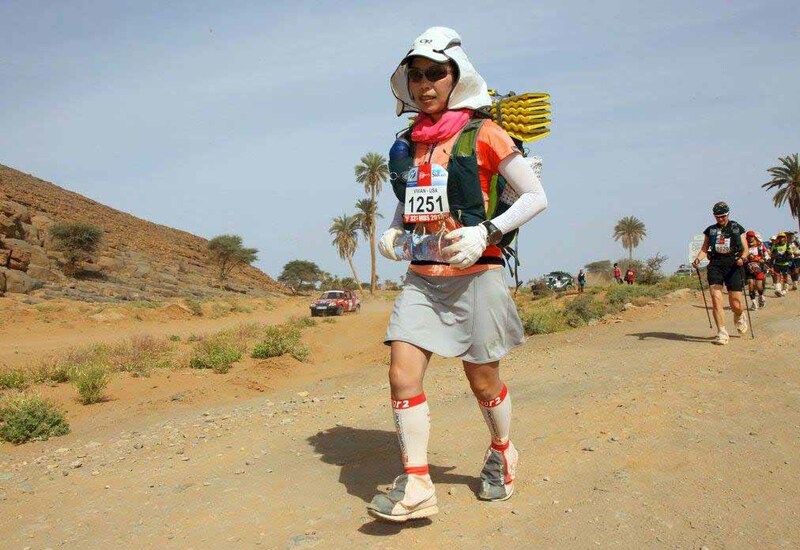 I am not planning to race MDS again, unless it is with my family (inspired by the father-son team in my tent and the Japanese couple celebrating their silver anniversary). The reason is that if I do it again, I would not have the “fall in love at first sight” feeling with MDS anymore. Time for something else challenging. What kinds of shoes did you wear? Did a pair last the whole race? I wore Nike Pegasus. They lasted! What did you learn about yourself from MDS that you didn’t know beforehand? I can really rough it out when needed. I am a clean freak at home. I do not allow outside shoes to be worn inside the house and fold blankets in a way that the end for feet never touches the end for head. During MDS, I could not shower for eight days and even washing hands had to be planned out with the limited amount of water. Surprisingly, I did pretty good. By Day 3, I had no problem wiping my face with the filthy glove, and would not even blink while eating next to a tent mate who was popping his blisters. It got me into the survival mode and I was able to let a lot of “standards” go. What advice would you give others middle-aged women who might tackle MDS? The odds are in your favor. Endurance sport is something that levels the age and gender differences. You do not see middle-aged female athletes breaking world records in track and fields meets, but there are plenty of course records set by middle-aged females in endurance events. DNF (Did Not Finish) rate is lower among female runners compared with male runners. Both the first- and second-place overall female winners were middle-aged. On the other hand, your competition will be fierce. Did you witness any serious suffering among other runners? Ever stop to help? Did anyone ever stop to help you? Yes, I saw several people suffering heat stroke and one with torn ligament around the knee. It reminded me how brutal this race could get, and I should not take any chances if I felt like I was at my body’s limit. Those people were already in the medical tent – I was there with blister issues. During Stage 2, one Canadian runner was running out of water and I gave her half a liter of water from my bottle. One Japanese runner dressed in cow costume was struggling under the heat and I helped to carry his water weight for a couple kilometers. The French runners during the long stage were my savior. My head torch was not bright enough and once the sky was dark, I had to stop every 10-15 steps to make sure that I was still on course. They definitely saw my problem and invited me to join them. We raced 40 kilometers together, step by step, kilometer by kilometer and checkpoint by checkpoint. Unbelievable camaraderie! How did your family greet you open your return? Any special dinner out? We were too busy to celebrate. I came back the evening of April 18, the busiest tax filing day for my husband since he works at Intuit, the TurboTax company. He had to go back to the office at night after picking up both kids from their swim practices. I fell asleep as soon as I got home and woke up the next morning, driving both kids to schools, then heading to the office. It was a swift gear change from MDS mode to working mom mode. The following weekend we binge watched all the missed TV shows – “Amazing Race” and “Survivors.” They did not watch any episodes while I was gone so that we could enjoy it together. That was very sweet!